Whew! I wasn’t quite sure if we were going to make it to Germany for Christmas this year. But on the day we flew out, they had just re-opened the Frankfurt airport, so I knew all was well. Maura and I had an uneventful flight after that. We caught our connection in Amsterdam, although I wish our layover had been longer- I would have loved to have done some shopping at that airport. We landed in Frankfurt, connected with Tim and Cala, but looked frantically for our luggage for 2 hours. Fortunately, those scanning baggage claim tickets saved us and Maura would be able to see Germany (she packed her daily contacts in her checked suitcase) Off to the train to Wurzburg to see Colleen!! We found our way to the hotel, settled in and Colleen came over after her lacrosse practice. We headed off to a quaint pub/restaurant for dinner, where I took her suggestion and had currywurst, and the rest dined on schnitzel (veal,) and pasta and toasted the holidays with their great beers. Off to slumber early as it was a long day. Wednesday we had planned to attend an authentic Christkindl (Weihnachts) market and we definitely weren’t disappointed. The weather was perfect, cold and a little snow to add to the atmosphere, just like Chicago. We walked around the market, enjoyed some Gluhwein, Cala found a place for chocolate crepes, and did some souvenouir shopping for friends back home. Colleen’s friend Jessie was arriving that day, so she went to meet her at the train station while we continued shopping. 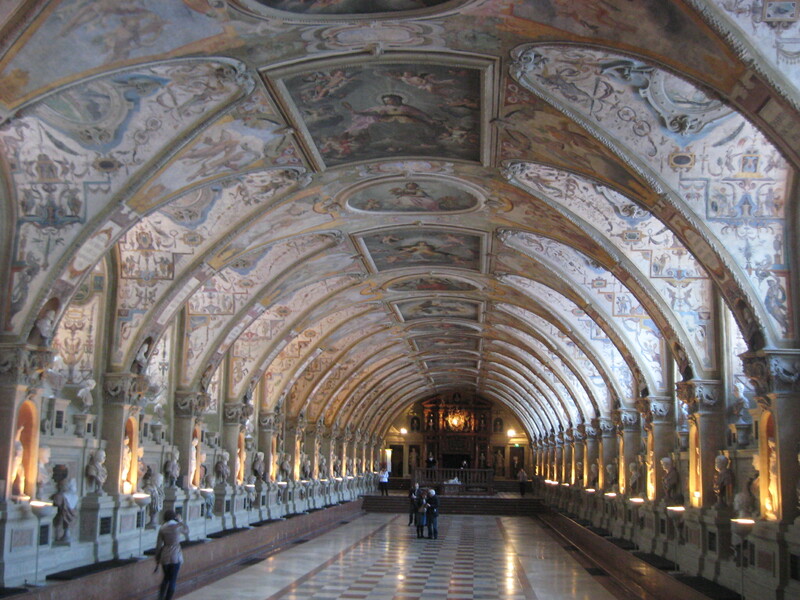 Our plan was to meet at 3:00pm at the UNESCO World Cultural Heritage Site, Würzburg’s Residenz. This is one of the most important Castles in Europe (so they say about all of them, don’t they?). Built in 1720-1744 based on the design by Balthasar Neuman with help from L.von Hildebrandt and M.von Welsh of Mainz. Not destroyed in 1945 were the magnificent staircase with its self-supporting vault and the brilliant ceiling painting by the Venetian artist G.B Tiepolo. Also known for its ornate stucco ornamentation by A. Bossi. This is also the site where they were filming the 3 Musketeers with Orlando Bloom, Colleen does claim a sighting of him during the production (not claim, it really happened. And I ran into him and his wife Miranda Kerr at our outdoor market. My only celeb sighting but pretty awesome). On our way back to the hotel, we opted to stop for coffee/hot chocolate at a cute little place. We warmed up, then headed back out into the cold, back to our hotel. We asked at the desk for dinner recommendations and they suggested a great Italian restaurant within walking distance. ( No wonder the people are thin, they do walk a lot, but their one bad vice is smoking!) Everyone was able to find something on the menu that tempted their tastebuds, as well as dad, though he wouldn’t quite splurge for a 50 Euro bottle of red wine, which led us to out last stop for the evening, a very nice Rathskellar. We did indulge in a very nice red (can’t quite remember the name) but the bottle was intriguing (note from Colleen: I’ll look for a picture but all of the wine bottles here in Franken are shaped differently than normal ones- see here if you’re really curious). The shape reminded me of a fatter Hershey syrup container, short and fuller in the middle, but the wine was delicious, the conversation was constant and the company was priceless! Back to the hotel to get ready for Christmas. – teaching is going well. We dont start our new semester until the end of February so I’m on the same schedule until then. – I have no idea where I can watch the NFC championship tonight (it doesn’t start until 9pm here.. uh oh). But GO BEARS! First off, it is imperative to say any adventure with the O’Connor family will inevitably be a good one. So I was sad to see Dr. O’Connor and Cala return stateside as the rest of us left Munich for Cologne. I cannot speak for the others’ time in transport because I took different trains than they did. I know what you’re thinking: who cares about the transport? To which I respond: apparently I do (yes, this was a bit of a surprise for me as well). 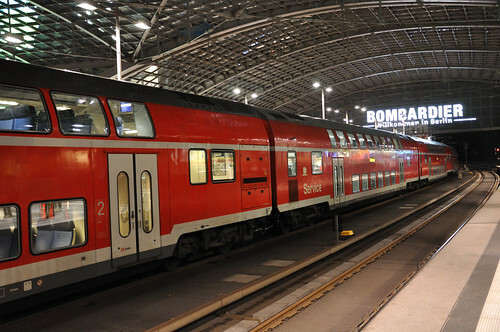 While taking trains may seem mundane, they constituted an essential part of my German experience, providing many cultural lessons about the country. I traveled from Munich to Frankfurt, Frankfurt to Wurzburg and Wurzburg to Cologne between 12:30 and 21:10 on one day. In Frankfurt, I had two minutes to get off the train and board the next one. Two minutes. I didn’t believe Colleen when she said the arriving train would arrive at exactly the right time and the departing train would leave at exactly the right time and I would be just fine, so long as I hurried. I honestly didn’t believe it was possible. Guess what? It is. I am still amazed as I write this retrospectively. From then on, I simply set an alarm for ten minutes before the train’s expected arrival time and would prepare to get off the train when the alarm went off. The order of it all was baffling and fantastic. I also enjoyed being able to people watch from within the train and view the sights outside of it. Things I now know about thanks to people on the trains include: German children are adorable; everything in Germany is done very systematically; and apparently until I open my mouth or look confused, I could pass for someone who knows German. The latter lesson proved embarrassing on a couple of occasions, but tangentially led me to learn a significant proportion of Germans speak English very well. Something I now know thanks to looking out the trains’ windows: small German towns look exactly like towns a “type A” preschooler draws in their coloring book. I guess I should explain that statement. Houses tend to be very linear, with pointed roofs rising to a point exactly in the middle and equidistant space between them. They also tend to be in bright colors, although side by side the effect is coherent and planned rather than random. At the very least, these towns—nestled in a sea of snow—were very picturesque. One last good thing about the trains: napping possibilities. Appearance-wise, Cologne has quaintness to it which the larger Munich did not, though it is undoubtedly a major city in the way Wurzburg isn’t. Think Munich : Chicago :: Cologne : Boston. Since we all arrived in Cologne late in the evening, we spent the rest of the night relaxing in our hotel room, reading and watching Monsters, Inc. Every viewing of a Pixar movie is a fantastic one, so needless to say it was great. I could go on and on about Cologne, so in order to spare everyone, I’m going to provide highlights/observations from the next few days. German food and beer is awesome. I am suffering withdrawal. We had a fantastic lunch one day with traditional food and great wheat beer, followed by espresso and coffees to warm everyone up before venturing back into the cold. The food, environment and company were wonderful. Another food lesson: non-German food in Germany is equally awesome. I had a taste of America in the form of a barbecue cheeseburger and fries and an amazing NYE dinner. But I’ll explain that separately. 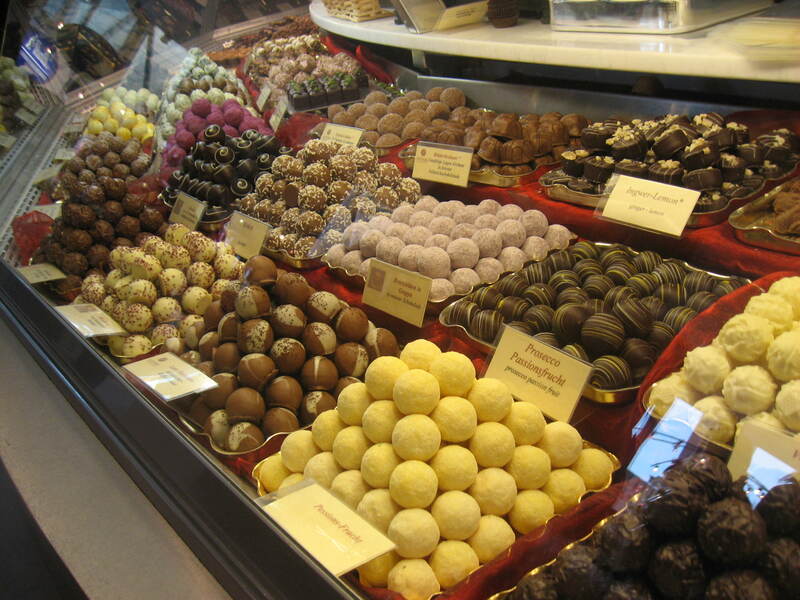 Cologne is—thankfully—home to a Chocolate Museum. (note from Colleen: I neglected to take pictures of my family while they were here but I have no less than 12 pictures from the chocolate museum) Since going, I am very knowledgeable about the making of chocolate, the trade routes of chocolate, the biggest consumers of chocolate and the nutritional properties of chocolate. Don’t challenge my chocolate knowledge. 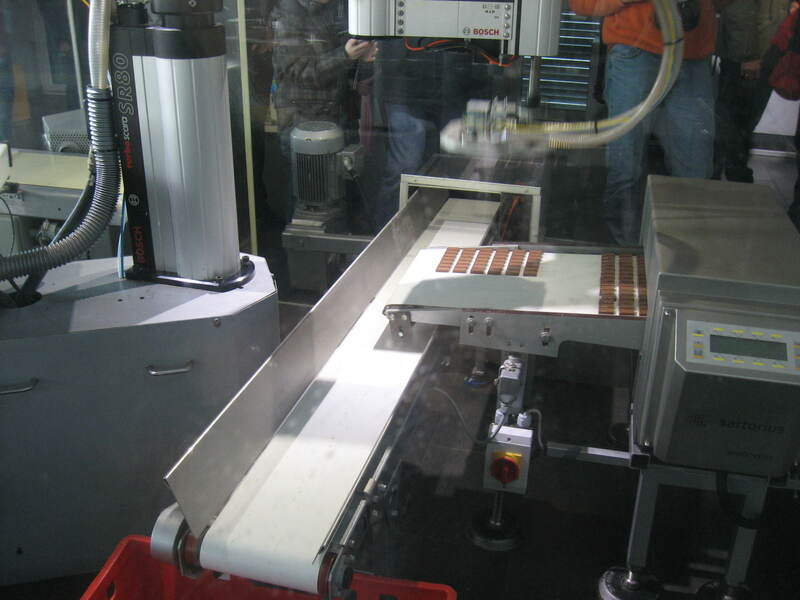 That aside, the most exciting part of the museum was by far the area where you could see chocolate being made. Most people walked through the room in about twenty minutes or so. Not Colleen and I. We had to figure out exactly how it worked, because when the chocolate wasn’t right in some of the phases, we were worried it would be thrown out. It was very, very stressful. I know reading this you won’t be able to grasp how stressful it was, so I guess you’re going to have to trust me on this one. Colleen and I were literally running around, following specific pieces of “problem” chocolate (aka chocolate which didn’t fit in the mold perfectly or didn’t fall out of the mold perfectly onto the conveyer belt), to assure they were not thrown out. Luckily, we discovered a large majority of “problem” chocolates were simply re-melted. The magical robot arm knew when there were problem chocolates, and they were released into a churner of hot, melted chocolate. There was one exception, in which case the problem chocolates were thrown into a bucket, presumably to be tossed away. I don’t like to think about it. Shopping. Cologne is known for being a wealthy city containing lots of shopping. We didn’t really indulge, but a walk from our hotel to the city center required walking through the shopping area. The streets of the shopping area were mobbed, thanks at least in part to post-Christmas sales. New Years: apparently we under-celebrate it in the US. Because in Cologne, everything was closed New Years Eve day and New Years day. This included the museums being closed and even the cathedral not giving its twice-daily guided tours. While this created a bit of a stumbling block in our planning, as we had anticipated going to the modern museum, it provided for some very nice reading and relaxation time. I couldn’t have planned a better NYE. (Thanks, Colleen, for doing it!) We went to a great Spanish restaurant which had a five course set menu for the evening. Good wine and great food ensued. The plan was to head out to a bar or club after dinner (we finished our scrumptious chocolate mousse around 11:30), but apparently Colleen and I have turned into old and boring people in less than a year since graduating from BC. We opted instead for a bottle of champagne and ringing in the new year on the street. It seems as though everyone (us excluded) purchased fireworks in anticipation of the holiday. The fifteen minutes leading up to midnight, everyone came outside and lined the streets. As the clock struck, fireworks went off from every which way. They were so many in number and so big in size, by 12:10 you could barely see more than thirty feet in the distance. It was very exciting and a great experience to be a part of. I can’t believe the sheer size of the fireworks people were setting off every which way! Definitely not high on the safety list, but it was an incredible experience. I am very glad to have had the chance to experience Cologne and its wonders, even if some of these wonders were closed during our time there. Cologne provided the relaxation and fun, laid-back experiences I craved during my holiday. I know I’m responsible just for writing about Cologne, but I want to say the entire Germany experience was a remarkable one. Coming from Cairo, I wanted to travel to an atmosphere which felt like Christmas. (Seventy degree weather in a Muslim-majority state isn’t very conducive to Christmas cheer.) Both the ambiance of Germany—the snow, the sights, the food—and the wonderful and caring company of the O’Connors made this Christmas holiday a very memorable one. I can’t express my gratitude toward them enough! Alright, Maura claims to have a decent amount of input in this post, I’ll let you judge for yourself. Also, fair forewarning: Dad talks a LOT about art and history. I’ll let you know where to cut off and skip ahead to. Enjoy all the pictures he included as well! I was able to see the white German countryside on our 3 hour train trip from Wurzburg to Munich the day after Christmas. My 5 companions all slept while we stopped at every little burg along the way. Our hotel was only 2 blocks from the Bahnhof (hey – I’m getting pretty good with this translation lingo). First stop in Munich was the local bierhalle (Schneider-Weisse). Maura like the weissbier and the hefeweissbier and even the dunkel. We ventured out to dinner near the South Gate (Sendlingertor) while Cala entertained us. She insisted on learning to count to ten in German. After multiple attempts and many corrections from Fraulein O’Connor, Cala got beyond fuenf (five) without laughing out loud and made it to zehn. Then she tried counting in French. Now we were the ones laughing as she grunted her way to dix. We all agreed she should stick to Spanish. Dinner at Ocui (open cuisine) was perfect. There are separate stations for pasta, stir-fry, salads, and beverages. Our adopted daughter Jessie stayed in the girls’ room – a forced quad. She won the single bed. The O’Connor girls all slept in the double bed and fought for covers all night. They were not happy until extra blankets were borrowed from an empty room. 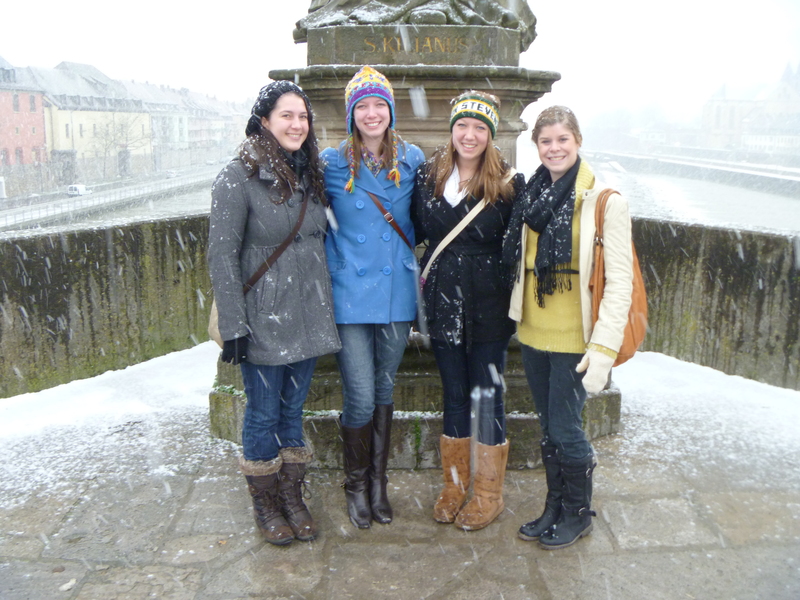 Monday, Dec.27th: Cala and Jessie took the train to Dachau. Maura and Colleen visited churches, churches, and more churches. There was a beautiful white stucco church, churches with lots of stainglass windows, more churches that were bombed in WWII, and some more churches. Colleen and Maura also visited three out of the four gates of the city, and climbed the stairs of the Alter Peter, which provided a phenomenal view of Munich no matter where you looked. Karyn and I had a wonderful day at the Residenz – the former royal palace of the Bavarian monarchs (and here’s where you stop reading until the next paragraph, unless you’re a history buff). The Wittelsbach rulers used it as their residence and seat of government until 1918. The antiquarium (66 metre banquet hall with wall and ceiling frescoes and end-to-end statues) is over 500 years old. 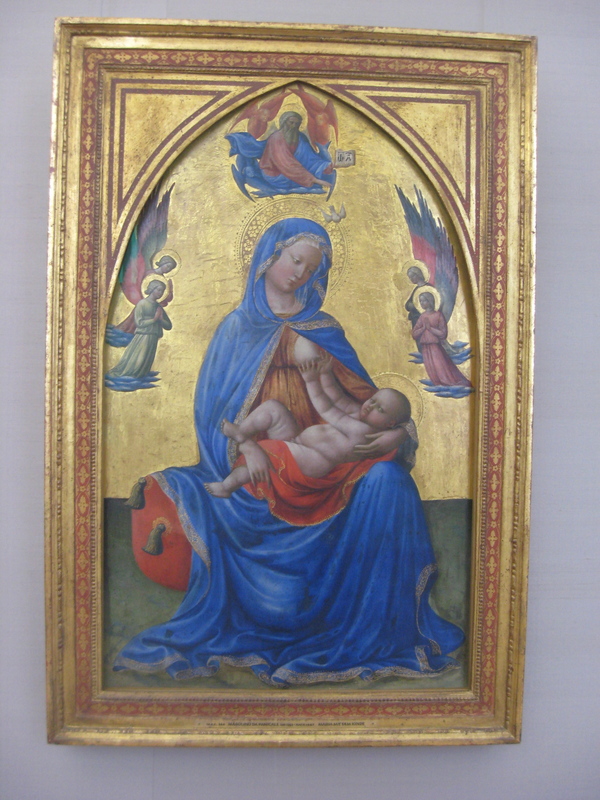 The architecture, interior decorations, and works of art range from early Baroque to Rococo to NeoClassical. The 4 hour short tour covered less than half of the 120 rooms. The royal treasury (schatzkammer) next door is 10 amazing rooms of jewelry, crowns, tiaras and many priceless religious items confiscated from the local monasteries since the time of Charlemagne (he be dead in 814). 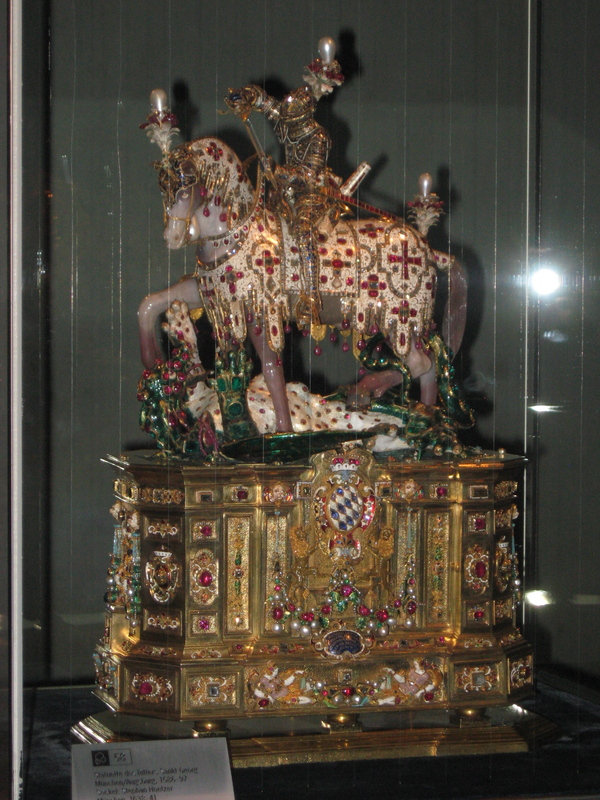 I especially liked the gold and enamel statue of St. George slaying a ruby and emerald dragon atop a gilded box decorated with opals, agate, chalcedony, pearls, and many other precious stones (1597). For history buffs, the cross of Queen Gisela of Hungary is in perfect condition – commissioned for the tomb of her mother Gisela of Burgundy, Duchess of Bavaria who died in 1006 and was buried in the Niedermunster (Abbey) in Regensburg. 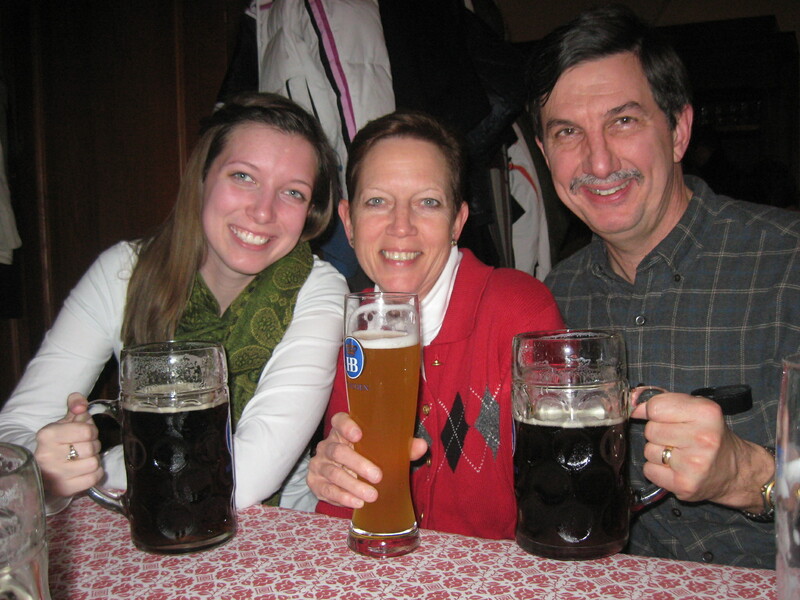 After a siesta (Cala and I adopted a few Spanish customs), the group convened at THE Hofbrauhaus for a Happy Hour. The place was packed, the oompa band was playing, and nonstop prost, cheers, salud, na zdrowie, and a rare ege’sze’ge’re from Prague. 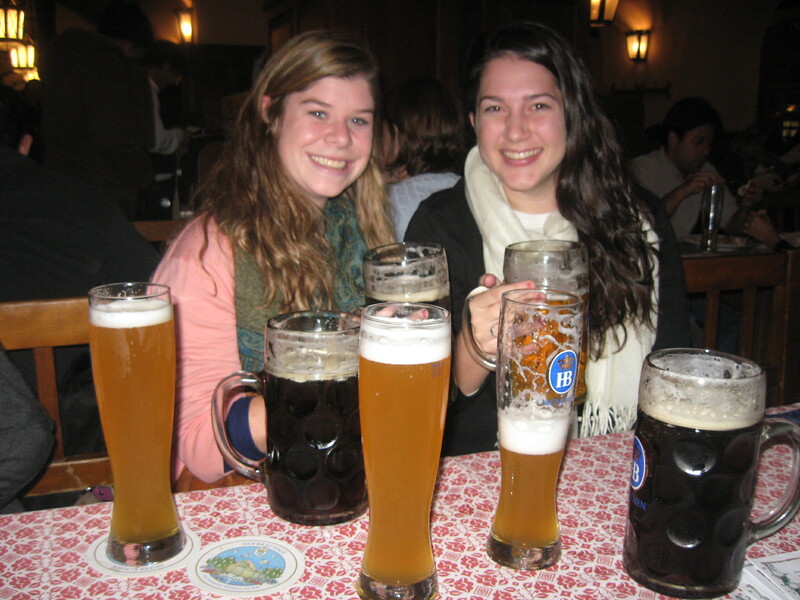 No matter what we ordered, most of the beers were served in the traditional one liter glass steins. It may have taken Cala 2 hours, but she finished her bier! Stumbling through deserted streets on a very cold winter night, we found our way to Cafe Osteria La Vecchia Masseria – ranked the #1 Italian restaurant in Munich by Lonely Planet. Plain wooden tables, a waiter with a sense of humor, and great food. Ravioli, pizza margherita, penne gorgonzola, and even lamb chops were excellent – with red wine of course. A great way to spend a very cold day wandering through the Reubens, Rembrandts, Durers, a few old Italians, and even one El Greco (The Disrobing of Christ).The special exhibit was a group of 12 paintings from the city of Amsterdam’s Historical Museum. They were group portraits peculiar to the Dutch 17th century with their traditional black outfits, white collars and wide brimmed black hats with a tall crown (capotain) often decorated with ostrich plumes.The rare group painting of women displayed the black puritan style with immensely detailed white lace collars.Very austere. Needed a splash of color from Giovanni Battista Tiepolo – he of the fresco ceilings of the throne room in the Royal Palace of Madrid and the massive ceiling in Wurzburg at the New Residenz (1744) above the famous entrance staircase (Treppenhaus). Cala FAILED to mention this (english) guided tour through many many cold rooms which was one of the highlights of Christmas. Maybe all that bratwurst has dulled her memory. (back to Maura?) Later that night we met up with Colleen’s old friend Basti, from the German exchange program way back in high school. We went to an Italian place with what I would have to say was the best pizza in Germany! After a brisk 4km walk, Colleen and Jesse went out with the guys “for an early night”. Cala’s definition of early is 11pm, so she started calling the Bavarian polizei at 2am to track them down (not really). I cannot say any more since she is a wonderful travel companion – but all ended well. The next day we split up (none too soon!). Karyn, Colleen, Jessie, and myself took the train to Koln, and Cala and Tim took the train to Frankfurt for their flight home the next day! Hello everybody! First, I’d like to thank my director, and all the cast and – oh. It’s just a blog. Never mind! But really, big thanks to Mom and Dad for providing the necessary funds for this fantastic Euro-trip! I’m supposed to write about Christmas Eve and Christmas Day, since I know the most about Christmas, clearly. Let’s see… Christmas Eve is the BIG DAY in Germany, whereas the 25th is the big day in the States. So pretty much everything is closed on the 24th and 25th because everyone in Germany celebrates Christmas (sorry, no Chinese and movie theaters around). So we had to find our own ways to entertain ourselves. We woke up on Christmas Eve to a white winter wonderland! 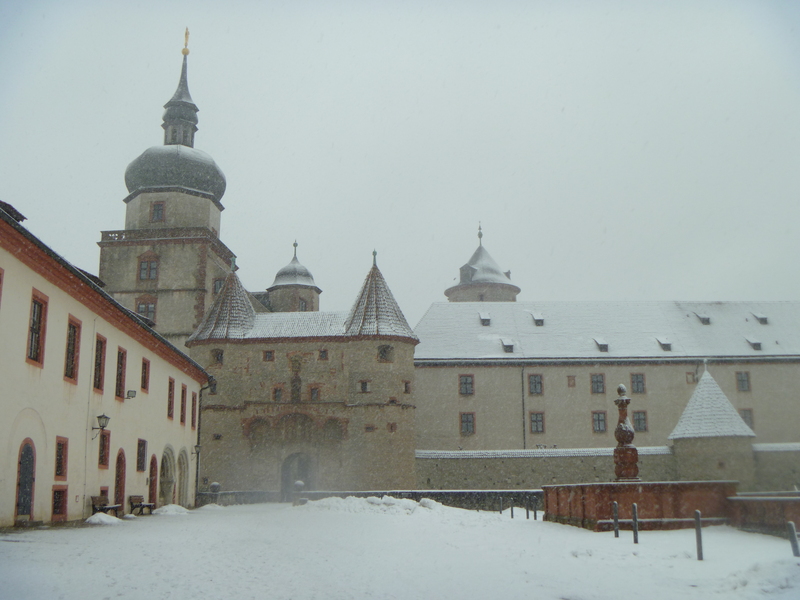 It was a lovely little flurry, so we decided to trek up to The Fortress of Würzburg (not sure if that is the official title, but you get the idea) (Festung Marienburg). The Fortress is over the river and through the park and up a grand hill, prime location for the upper hand on attacks – however, a bit tricky for tourists to get to. So we bundled up and headed out, through the now – heavier snow, over the bridge, through the park and started up when Colleen says, “Oh I thought we would take the scenic route up, and we can take the stairs through the park back down.” Of course, my mom is thrilled that there is a scenic route, so we instead start walking up steep, slippery, icy hills up the backside of the fortress. I, being ill-equipped in the winter hiking footwear department (as well as athletic department), required a bit of assistance up the hill, but we made it in good time. The fortress was initially home to the royalty of Germany (?) and the Prince Bishop of Würzburg until the Winter Palace (aka the Residence) was built in the 1700s, at which point they moved there (also a very chilly place, not many torches or ovens. Here I should mention Cala’s body fat is probably around 2%. On a good day) Anyway, the real highlight of the trip was the view of Würzburg from the top of the hill. 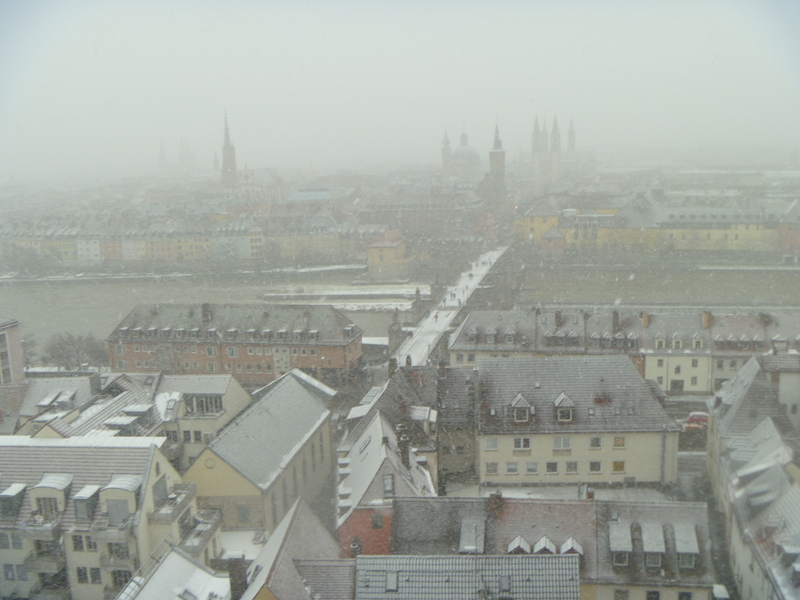 Despite the heavy snow, it was a fantastic view of the city on the river. We walked by the keep, the horse pool (no joke) and around the entire fortress before heading back down for some lunch. We stopped in a little café, one of the only places still open, and grabbed a bite to eat. After some delicious hot chocolate we headed back to the hotel for some relaxation time before dinner. Colleen managed to get reservations at one of the only restaurants open on Christmas Eve – and a Mexican restaurant at that! The food was delicious, as well as the margaritas, Maura’s favorite part. After dinner we went to 10:30pm mass at St. Killian’s Cathedral. It was, of course, a bit chilly inside due to the fact that it is huge and made of stone, but there were a lot of candles, and pretty soon with everyone huddled in the pews (it was packed!) it warmed up a bit. We didn’t understand any of the mass, despite Colleen’s best efforts to translate while whispering for all of us, but there was one part we understood: the songs. They had the lyrics printed on our pamphlets, so we got to try our best at German pronunciation while singing Silent Night, Greensleeves, Away in a Manger, and Hark the Herald Angels Sing. I would give us a B- on pronunciation, but an A for effort! We returned to the hotel for our last bit of tradition – our Christmas Eve gift exchange. For those of you who don’t know, it is an O’Connor tradition that the three girls all get to open one gift each on Christmas Eve, and that gift is always matching pajamas! Although now that we are older, they more coordinated than matching. So we opened our pajamas – even Jessie! And hit the sack, with hopes that St. Nicholas soon would be at the Novotel room 220. Christmas Day! Since we were told ahead of time that literally every single shop and café would be closed on Christmas Day, we prepared for total laziness. Colleen and I had gone to the grocery store the day before and bought bread, cheese, sausage, chips, fruit – pretty much anything non-perishable that did not require cooking. We feasted all day! We actually ate breakfast in the hotel lobby, and German breakfasts are a little different than the American buffets. Of course there was toast, jam, cereal, eggs, sausage, the usual – but there was also little packets of Nutella for spreading (Maura’s favorite) and an assortment of cheeses, meats, and fish to put on your bread (Dad’s favorite). Of course they had coffee (Mom’s favorite) and the best part – the served black olives with breakfast! My favorite! Basically we spent the entire day in bed. Literally. The rooms were a bit small, so we didn’t have a lot of room to sit so we all just sat/laid on the bed all day, playing cards, watching movies. We got Mom and Dad hooked on Modern Family – great show, for those of you who don’t watch it. We played Phase 10, watched Love Actually, ate lots of cheese and sausage and M&Ms, and oh I remember CALA WON WIZARD!!!! For pretty much the first time in a long time. I’m awesome. We exchanged the few gifts we had brought from home, and Jessie had brought us presents from Egypt! She gave her adopted sisters exquisite silver necklaces (mine’s the prettiest) and for her adoptive parents a beautiful hand-crafted leather bound book for all of our photos, with “O’Connor Christmas 2010” on the cover. We loved having Jessie be an O’Connor for Christmas! Overall, Christmas celebrations in Germany were wonderful. We got to spend time with our fantastic family, eat good food, and did I mention that I won in Wizard? Second weekend of December I headed down to Zurich with my friend Nadiya to stay with a friend of hers. Zurich is ridiculously expensive (in comparison to what I’m used to in Germany) but apparently people earn much more there so it all balances out. 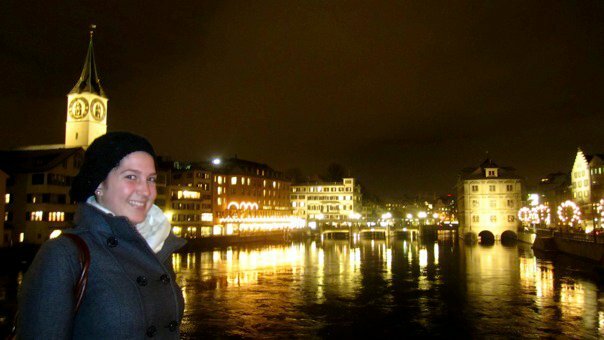 From what I experienced in Zurich, I liked it, but I don’t think I could live there permanently. It’s a hub for a lot of businesses and of course has tons of the infamous watches and chocolate. 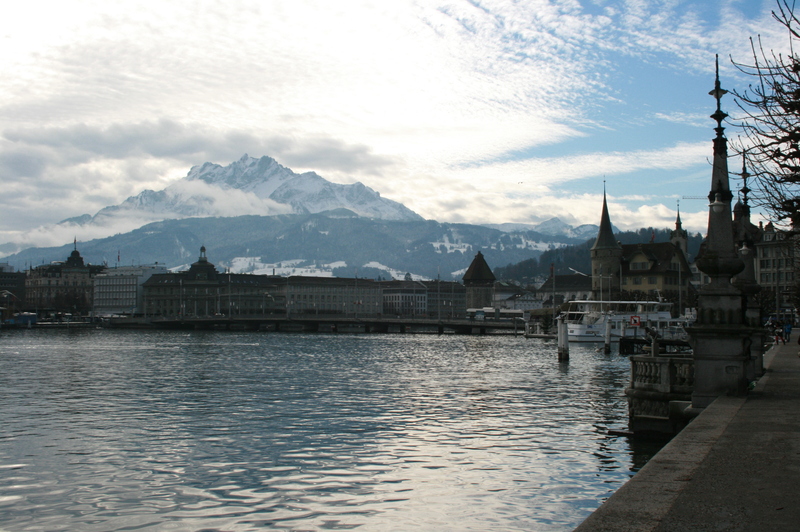 We were lucky enough to take a day trip to Luzern (Lucerne), about an hour away from Zurich, which is absolutely beautiful. It’s still in German-speaking Switzerland (thankfully) and the views are wonderful due to the lake and backdrop of mountains. A side note about Swiss German, or Schwitzerdeutsch- it is nearly impossible to understand if you’re not from Switzerland. The Swiss can easily understand the Germans, and everyone understands one another if you speak Hochdeutsch (high German, which is taught in the schools and is what I learned, no dialect), but Swiss German might as well be another language. Back in Würzburg, school rolled right along until Christmas break (which didn’t start til the 23rd! ), but during my conversation lessons with the students, I did learn a great deal about Christmas in Germany. It’s celebrated on the 24th, instead of the 25th, and the 25th and 26th are two observed holidays. So, really, Christmas is 3 days long. Awesome. There’s a pretty distinct North-South divide when it comes to the Weihnachtsmann (the equivalent of Santa Claus) or the Christkind (has the same role as Santa, but is an angel with long blonde hair, or the baby Jesus; my students were always split half and half on how the Christkind looks). Anyway, bottom line is the kids still get their presents from this foreign, magical source but they get them on the 24th. Apparently sometime after church (which is attended on the 24th as well), back home all of the children have to leave the living room and the doors are closed so they go watch tv or something. Then, magically, 15-20 minutes later a bell rings from the living room. The bell means the Christkind/Weihnachtsmann has come and the kids can come into the room and open their presents. This is where I have a problem. What?! Presents on the 24th? Okay, I could deal with that. But no build up of anticipation, dancing of sugarplums in their heads, waking up at 6am to race down the stairs and see what Santa brought? No. Not to mention the complete lack of imagination involved here (a bell, that’s it?). Somehow it still works. Good for them. And while we’re addressing slight cultural differences, New Years here is called ‘Silvester’, named after a Pope who apparently did lots of important things, among them converting Constantin I to Christianity. What I found to be one of the coolest things about Silvester here though, is the fact that everyone lights fireworks at midnight. No, not just the official-sponsored city fireworks show, everyone. It’s like the 4th of July, in the middle of winter, and probably way more dangerous. We were in Cologne and the street we were on clouded up within 3 minutes of midnight, people had sparklers left and right and fireworks were being shot off literally from street corners. Of course this lasted about 30 or 45 minutes, and I can’t forget to mention the legality of open containers so of course we popped open some champagne as well. I already mentioned one ‘resolution’ (to update this more often), but I’m really not a big fan of New Years resolutions. I think from age 8-16 I vowed to stop biting my nails which of course never lasted more than a few weeks (still guilty), so instead I like to make goals. – Don’t turn down an invitation. My friend Pat, in Russia, has commented on this more than once in his blog, but you never really know who you’ll end up meeting or what kind of fun you’ll have when you get invited somewhere. – Keep traveling/taking advantage of my current position. I have absolutely NO idea where I’ll be next year (the possibilities are literally all over the globe) so I’d like to take advantage of my place in central Germany, not to mention central Europe. Hope everyone had great holidays and look forward to entertaining updates coming from my family and Jessie!